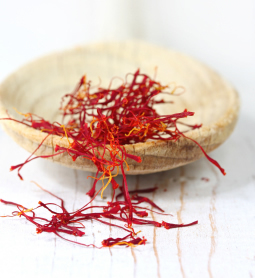 Saffron, the world's most expensive spice, is derived from the dried stigma of the flower of the saffron crocus. The use of saffron comes down to us from antiquity; the spice was used by ancient Greeks, Indians, and Egyptian in both cooking and medicine. Traditional uses of saffron extend far beyond the kitchen. Saffron has been used to reduce fever, to regulate the menstrual cycle, to combat epilepsy and convulsions and to treat digestive disorders. The bitter glucoside picrocrocin is responsible for saffron's flavour. Saffron yields a deep, rich yellow that has given its mark to the robes of Tibetan monks, and just a single thread can flavor a whole meal, Saffron contains more than 150 volatile and aroma-yielding compounds. Saffron Side Effects: None noted. Saffron is unknown in the wild and only exists under cultivation. Saffron is a perennial plant that flowers in the fall. The slender, reedlike, green leaves look rather like clumps of grass in the spring. 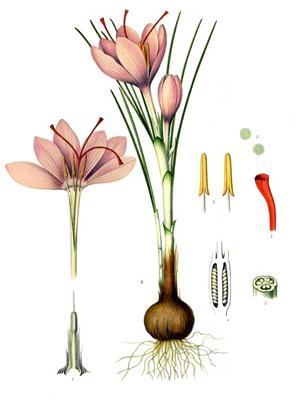 The purple flowers are sterile, most likely a result from human cross breeding to produce longer stamens, the orange threads used in cooking; propagation is by root division. Saffron's expensive price is a result of the labor intensive way it is harvested, the slender red stamens must be hand trimmed from the flowers shortly after blooming. Plant in loose soil in a location that will receive plenty of autumn sun. Only water under severe drought conditions. Saffron makes an attractive and useful border to the kitchen garden. It is an herb of the Sun, and under the Lion, and therefore you need not demand a reason why it strengthens the heart so exceedingly. Let not above ten grains be given at one time, for the Sun, which is the fountain of light, may dazzle the eyes and make them blind; a cordial being taken in an immoderate quantity, hurts the heart instead of helping it. It quickens the brain, for the Sun is exalted in Aries, as he hath his house in Leo. It helps consumptions of the lungs, and difficulty of breathing. It is excellent in epidemical diseases, as pestilence, small-pox, and measles. It is a notable expulsive medicine, and a notable remedy for the yellow jaundice. My opinion is, (but I have no author for it) that hermodactyls are nothing else but the roots of Saffron dried; and my reason is, that the roots of all crocus, both white and yellow, purge phlegm as hermodactyls do; and if you please to dry the roots of any crocus, neither your eyes nor your taste shall distinguish them from hermodactyls. Mountain Rose Herbs . Learn Saffron , , (Sept 2005): Modern research is confirming the effectiveness of saffron as an antidepressant and an anti-convulsant. In some studies, it has proved as effective as fluozepan in treating depression.